Don’t let your old tape recordings decay and become unplayable. Digital recording, specifically the sound of high-end analogue to digital converters, has now reached a sufficiently high level of quality to make archival to 24-bit WAV or AIFF files a ‘no-brainer’. The problem is finding a machine of the right format and, more importantly, still sounding like new to play it on. Look no further. The studio has an extensive collection of analogue reel-to-reel machines, so we can transfer from almost all of the various stereo and multi-track formats to pristine digital. More importantly, all are our machines are regularly serviced and calibrated to ensure playback quality exceeds the original specification – a labour of love for engineer Martin relying on over 30 years experience maintaining audio tape recorders. Furthermore, the azimuth angle of the play head (which adversely affects high frequencies and mono compatibility if incorrectly set) is optimally adjusted to match each and every tape, to correct errors in alignment of the original recorder and ensure perfect playback. Where alignment tones exist on the tape, the EQ is also adjusted to match on a tape-by-tape basis, otherwise carefully calibrated standard EQ is used. Various noise reduction formats are also on hand to match any used on your tape, again all carefully calibrated for optimum sound quality. Technical details of the recording format should be written on the box (see example photo), but don’t worry if these are missing – we are used to doing the necessary detective work to get the very best quality transfer from your tape. Digital tape masters also are not immune from degradation over time, and the playback error-correction capability has limits. This means that once enough data becomes corrupted the tape will quite suddenly become unplayable, and there is often little or no warning of such failure. Maintaining a digital ‘clone’ in WAV or AIFF format (and at least two backups of that data file, each on a different drive or storage device) is the only guarantee against this loss. 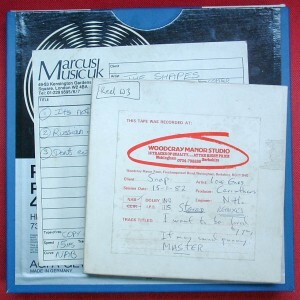 The White House was an early adopter of digital for stereo masters, firstly F1 Beta then DAT, and has always offered free archival of songs recorded and mixed in the studio. If you recorded here (or in The Basement Studio in Wokingham, 1981 to 1987) then your songs are almost certainly still available in CD quality, and modern remastering can yield spectacular improvements in the original sound. Please contact us if you’re interested, especially if you only have a cassette copy! Fortunately there is a cure – a precision heat treatment known as ‘baking’. This process temporarily reverses the chemical deterioration allowing perfect playback for a few weeks before the stickiness slowly returns over time. We have invested in the safest type of unit to ‘bake’ audio tapes and cure ‘sticky tape syndrome’ – a biological incubator. The required treatment temperature is maintained within a fraction of a degree, and a sensitive fail-safe cut-out protects your irreplaceable masters in the unlikely event of a problem. The time required depends on the formulation of the tape, the state of decay and the width of the tape. ¼” stereo reels may take between 1 and 2 days (allowing for the essential slow warm-up and cool-down), while a 2” multitrack reel may need up to 4 days. It is very important to note that pre 1970s tape formulations, and many later ‘domestic’ ones do NOT need baking, and some can actually be damaged by heating. To ensure correct and safe handling every tape is carefully inspected and assessed before baking and playback. Please contact us for advice. Despite the relatively long time required for successful treatment it is a very economic process, and costs are reduced by making up a batch, so please contact for a competitive quote. Track format: ½ track stereo or mono, ¼ track stereo or mono, full track mono. Tape width: ½” and ¼”. Tape speed: 30ips (inches per second), 15 ips, 7.5 ips, 3.75 ips. Noise reduction (if used): Dolby A, Dolby SR, Dolby B, DBX type I, DBX type II, ANT Telcom C4, BEL. 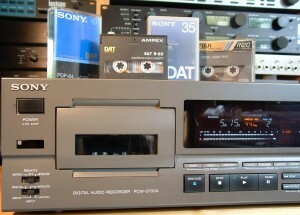 Cassettes can also be transferred if you’ve lost the original master tape! Please contact us if you have a different requirement as the collection of machines is constantly being added to. Recent additions include a customised Fostex E8, which will also play recordings made on the earlier A8, R8 and Model 80 machines, but with significantly better quality. 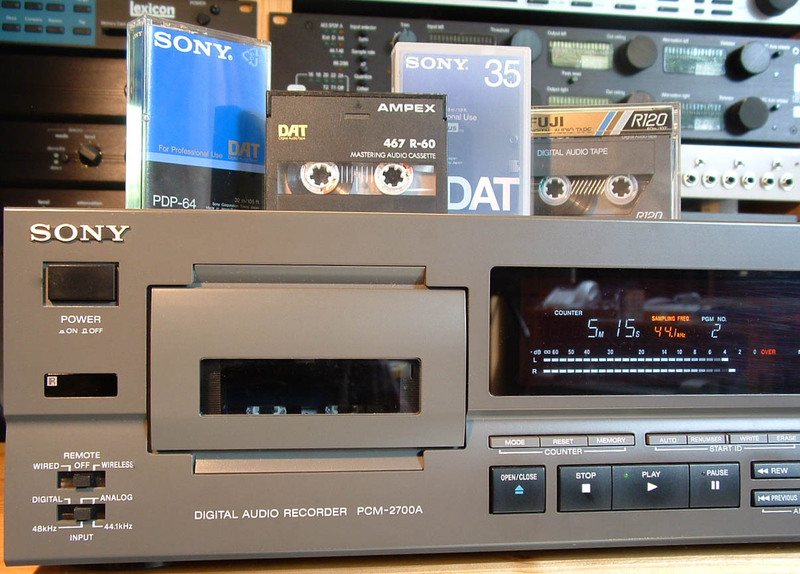 Digital Audio Tape cassettes can also suffer from severe degradation over time, resulting in dropouts (clicks, glitches and gaps in the music), eventually resulting in complete failure to play. Some brands are much better than others, but all use ‘metal’ tape which has proven to be less stable than conventional ‘oxide’ formulations. Cloning of the digital data to WAV files is therefore highly desirable, allowing multiple backup copies to be maintained. This is not the same as re-recording the analogue audio output of a DAT player, which inevitably degrades sound quality. We transfer DAT tapes entirely digitally. We have specially modified DAT players that show the error rate of the data from the tape during playback, meaning that problem tapes can be quickly identified. This monitoring indicates correctable errors (which do not affect the audio at all), uncorrectable errors (which the player attempts to disguise but usually result in distortion, clicks or stutters), and muting (where the player can’t make any sense of the data and switches off the audio completely). Consequently, if only ‘correctable’ errors are encountered during the transfer, the data in the WAV file will be EXACTLY what was originally recorded on the DAT – a perfect clone. Even when the tape has started to degrade, ‘uncorrectable’ dropouts during playback are often temporary in nature, caused by dust and debris momentarily blocking the play head. Hence, even if clicks are encountered on playback, a second pass will frequently give clicks in different places and careful editing around the glitches (with single-sample precision) can also result in a perfect clone, though clearly this is somewhat time consuming and it is far better to clone the tape while still in perfect condition. Please note that this error reporting cannot reveal all such errors on a copy of a faulty DAT tape. The original recording should always be used where possible for the transfer to WAV. Certain troublesome brands of DAT also benefit from ‘baking’ – see above. 1 The F1 adaptor included ‘pre-emphasis/de-emphasis’ circuits to reduce noise introduced by the old-technology A-to-D and D-to-A converters. ‘De-emphasis’ of the analogue output signal is automatic if the tape was recorded with ‘emphasis’ on, which they almost always were. 2 At that time A-to-D and D-to-A converters were expensive and a single ‘chip’ was used to encode and decode the playback of both L and R channels, resulting is a very slight time delay between the two channels in the digital data. Consequently summing two stereo channels to mono resulted in a slight loss of high frequencies. Audio & Design Recording produced an add-on converter to correct for this loss, but it required processing of the signal both before and after the F1 unit. These encoded tapes should be labelled ‘CTC’ (Coincident Time Correction) and need to have a suitable CTC decoder for correct playback, which we have. Both CTC and de-emphasis can ONLY be correctly decoded in the analogue domain, consequently recording the analogue output of the F1 adaptor is the preferred method of transfer, which is exactly what we do. Recordings on the F1 Betamax format have proved to be far more durable than DAT, but spares for Betamax machines are now non-existent, so transfer while a working machine is still available is essential. We can digitally transfer all ADAT format tapes to WAV or AIFF with perfect sync on multi-tape sessions. 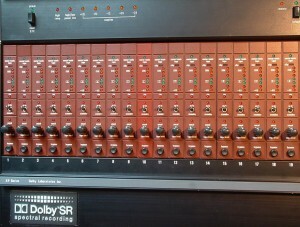 Each SVHS tape carries 8 audio tracks, with multiple machines used to record more tracks if required, so they usually come in pairs or threes, allowing 16 or 24 tracks. The early machines were 16 bit resolution and designed to run at 48kHz, but could be ‘slowed down’ using vari-speed to be compatible with 44.1kHz CDs. 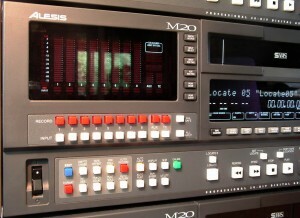 Later (type II) machines improved the sound with 20-bit recording and added official 44.1kHz support. The sound quality was good by the standards of the day, but not a patch on modern D-to-A converters, so transfers should always be carried out by digital ‘light-pipe’ optical connections for best results, which is what we do. We have top-of-the-range M20 machines, which feature 20-bit resolution, the most durable mechanism and error-rate reporting, allowing playback problems to be highlighted. As with DAT, dropouts can occur randomly during playback, so two passes are usually taken to allow editing around any clicks or distortion encountered. We transfer digitally via optical links to the HD24, a later hard disc version of the ADAT which replaced the tape-based decks. Sync this way is sample accurate, allowing two or more playback passes to be perfectly aligned for editing, and WAV or AIFF files can be efficiently exported. Alesis no longer have spares for tape-based ADAT machines and transfer is highly recommended while it is still possible. As with DATs, certain brands of tape have shown to be very troublesome and prone to serious decay, but again ‘baking’ can help. 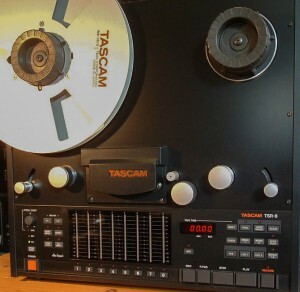 DTRS was developed by Tascam as an alternative to the popular Alesis ADAT, but using the smaller Hi8 video tape. They made various models: DA38, DA78, DA 88, DA78HR and DA98HR. 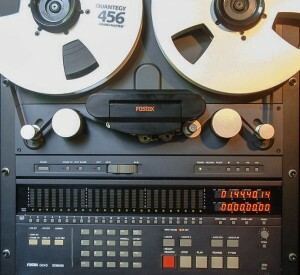 Like ADAT the machines offered 8-tracks per tape and could sync together to offer serious multitrack capability. 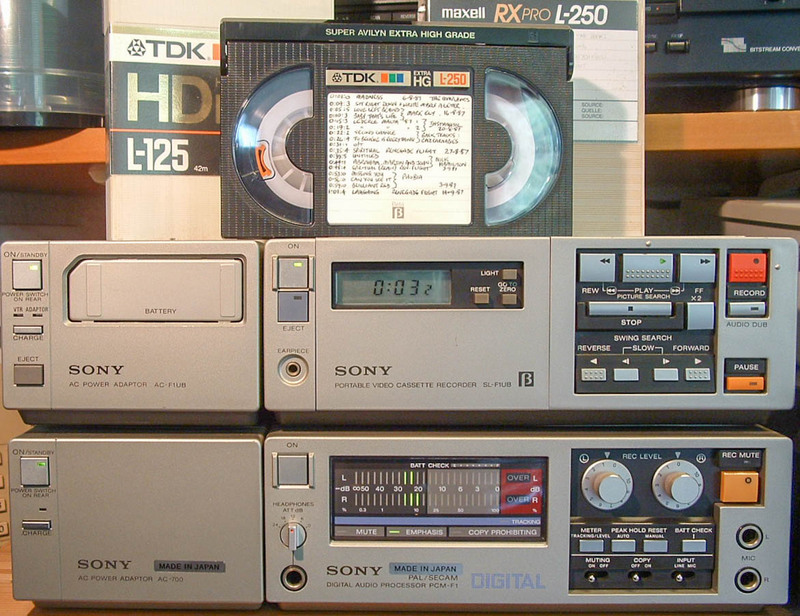 The early machines were 16 bit resolution, but ‘HR’ models increased resolution to 24 bits and added sampling frequencies up to 192kHz (in the top-of-the-range DA98HR) by sacrificing the number of audio tracks per tape. 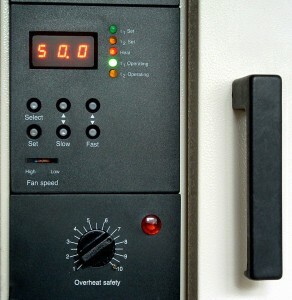 Many video facilities used these machines for soundtrack work thanks to the integral timecode. We can digitally transfer all DTRS-format tapes to WAV, BWAV or AIFF with perfect sync on multi-tape sessions, via TDIF cables straight into Pro Tools, which also ensures video sync is maintained. We have the latest Tascam DA98HR machines which feature error-rate reporting, allowing any playback problems to be highlighted – important as the data density is very high and even small amounts of dust can cause dropouts and glitches. 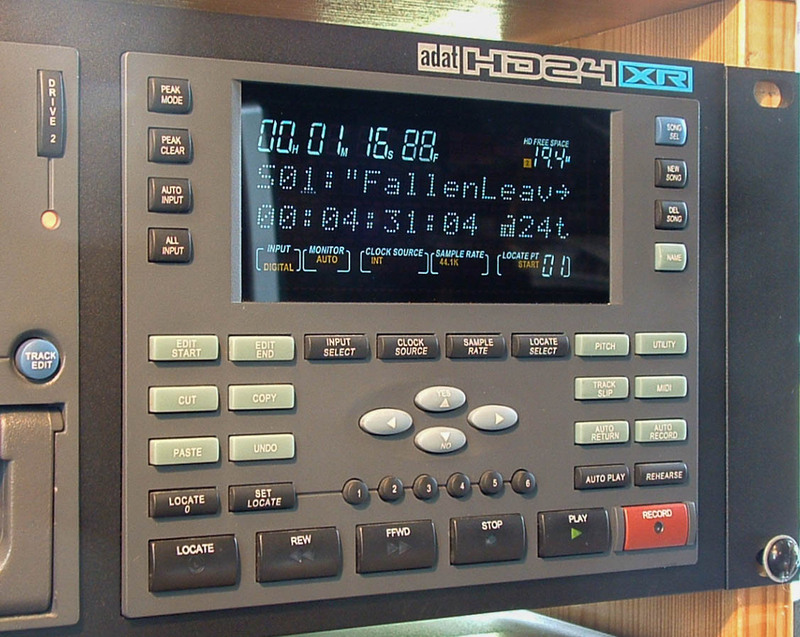 These can occur randomly during playback even with new tapes, so two passes are usually taken to allow editing around any clicks or distortion encountered. Certain brands of tape have shown to be very troublesome and prone to serious decay, but ‘baking’ has proved to be successful in most cases. We can extract WAV or AIFF files directly from these hard discs, either installed in a ‘caddy’ or as a bare drive. 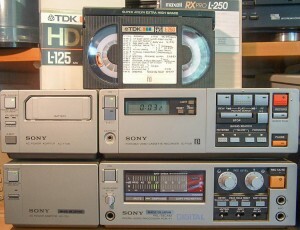 Unlike ADAT tapes, these hard-disc machines recorded up to 24 tracks per machine. There were two models – one basic and one with significantly better converters and therefore sound quality. Because of the relatively low cost these were used by many studios, and also frequently for capturing ‘live’ sound directly from a large PA desk. To get 24 tracks of 24-bit audio to reliably record onto the slow hard drives of the day, the drives had a unique format dedicated to fast streaming, and which can’t be read directly by a PC or Mac. Connecting such a drive to a computer will usually prompt a ‘reformat required’ message, which, if followed, will erase your audio. We have the correct adaptor and software to allow reading the drive and safely extracting the files. IT professionals say that there are two types of computer users – those that have lost data due to a hard-drive failing, and those that have YET to lose data… Keeping WAV file backups of HD24 data drives is your only guarantee against such failure. While working from the original master tape is always the best way to go, sometimes this just isn’t possible, so as a last resort we can wash vinyl discs, transfer to WAV and digitally remove the remaining clicks, rumble and as much surface noise as possible, and master for re-issue on CD, download or even back to vinyl! 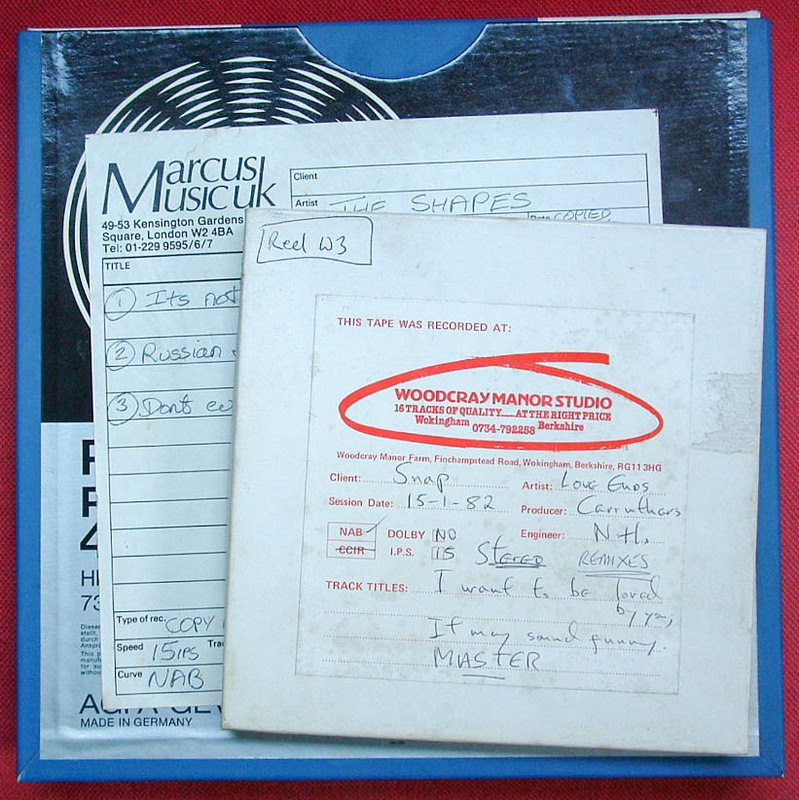 This process is very time consuming: each click needs to be removed manually, to prevent the details of percussive elements in the music being destroyed, so is only suitable where no viable master tape (or safety copy) exists, and for commercial re-issue only – please don’t ask us to clean up your treasured record collection!